There's something about hallway runners that manage to add just the right amount of decorative flare that's needed in the average hallway. When many people decorate their homes they don't usually spend much time on their hallways, if they choose to spend any time decorating them at all. Some hallway walls may be adorned with a few family pictures, a painting, and maybe a mirror if they're lucky. Many don't get the décor treatment that they truly deserve, but a well-placed hallway runner can bring together any hallway. Once you learn about the style benefits of hallway runners, you'll be eager to buy one for your hallway of choice. Your average sized area rug is almost always too wide for any hallway, and those that do end up fitting can look very awkward and out of place. Hallway runners have the added benefit of working with virtually any kind of flooring material. Some people think runners are just for hallways with hardwood floors, but hallway runners can also spice up tile hallways and carpeted hallways. 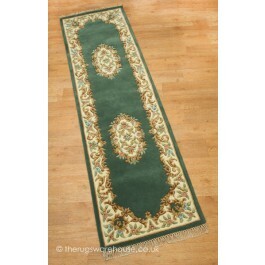 Like rugs, hallway runners can come in a variety of styles. You could choose to have a runner that's made of thick shag carpeting, or you could have a thin runner with a simple design. Some people choose to forgo decorating their hallways because they think it'll look too cluttered or overdone. Hallway runners manage to add just the right amount of décor difference to hallways without overdoing it. Unlike other area and decorative rugs, you don't have to worry as much about your runner clashing with the current décor scheme. A hallway runner with bold patterns or bright colors rarely look out of place in hallways, since it's just a thin and rectangular form of carpeting it doesn't take up a lot of décor space.